I wonder where the author got this impression. May be because of the Chagos issue, s/he tends to generalisations. This week, the road safety unit has been organising campaigns and demonstrations about the importance of wearing safety belts. Members of the public are giving the opportunity to ride “la voiture tonneau”. It is a car simulating a barrel crash. In this experience, the public are explained the importance of wearing belts especially at the back. The demonstrations were held in various places in Mauritius and the last demo will be held in Caudan in the afternoon. Filling stations have decided to limit their opening hours according to the time prescribed by the law. As from the 13th May, the Petrol Retail Association has decided not to work beyond normal working hours. 3. Risk of being robbed. The association saw in the use of credit card a deterrent to the robbing but here again there is the issue of commission fees charged by banks. The issue of stopping to sell household gas was also in the agenda. An appeal has been sent to the government to revise their margin. Should the resolution be followed by all the 76 stations, the revised opening hours should be as follows: 7 am to 8 pm during the week, and 7am to twelve on sundays and holidays. We have seen and heard so much lately about Piton de la Fournaise, which erupted for the nth time since two weeks. This latest eruption brought fear among the neighbours of the volcano. They were advised to leave their homes for shelter, as the lava flow inched dangerously to the residents’ home. The eruption ceased yesterday to again vomit ashes and lava today. 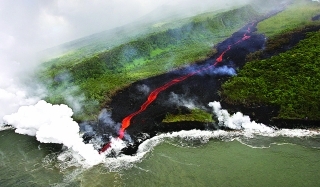 The lava flow to the ocean has made visible fishes which were up to now unknown, probably due to the destruction of their habitats by the lava. The ashes and sulferous smoke from La fournaise during these last days had an impact on dodo land. Indeed, some parts of the island, especially the west and the central plateau received acidic rain. The impact on agriculture is not serious at first sight, but the rain will definitely impact on sugar cane yield. I think i will start a new series on the thrills and adventures i experienced at my place of work. As you may already be aware (i mean if you followed my adventures till now), I have a funny boss. Two weeks ago, he called me (it was a Monday morning), informing me that he had a meeting with his boss in the weekend. Yes, he too has a boss!!! His boss happens to be his brother. In his private meeting, big B told him that there needs to be someone worthy to keep a watch on all the investment being made in spareparts. It so happens that two names have been spelled out, mine and his (my boss’s name). Since i already told him i won’t be able to do two different kind of chores at the same time, he did not insist and volunteered himself to do the watchman. In the end, i wondered why he told me this “secret”. Was that some kind of reverse psychology so that i would volunteer myself to do my old job? i don’t know. I am not surprised that he invented the part of the story that his brother mentioned my name. One day he smsed me telling me that he won’t make it to the office for he suffered from chronic diarrhea. I even sympathised with him, replying to take care. Two days later, i was told that on the particular day of the supposedly diarrhea, the patientÂ was enjoying himself in a five star resort on the west coast of the island. Ouahh!!! What a big liar!!! Well i guess i will end this series for now. I will continue with more adventures and hopefully more thrills next time. No longer working on steel! Since the 26th March 2007, the 181 employees of Desbro are no longer working on steel bars. When they reached their place of work at Plaine Lauzun on this particular morning, three employees were distributing letters of dismissal. Those who have been working for more than three years were informed in the letter that they are giving three months notice as from the first of April 2007, and thereafter no salary will be received. It was end 2006 that Desbro intended to end its operations after nth request sent to the ministry of commerce for an increase of price in steel bars of 37%. The ministry did not acceed to the request. The Management Audit Bureau was sent to enquire the matter and it was decided to raise the price of bars by 20%.Â Production which was stopped resumed. But against all odds, on the 26th Monday morning, Desbro closed its doors claiming losses of more than 30 million rupees. According to rumors, Desbro will be taken over by South African company Murray & Roberts. Desbro was the leader in steel on the market with a share of more than 75%, in front of Samlo andÂ Consolidated Steels with 17% and 3% only. You are currently browsing the tapijo blog archives for April, 2007.